Fry in: Crisco or, in the UK, Trex (apparently, for true Southern fried chicken, you’re supposed to use Lard but Lard freaks me out so I don’t use it and Crisco or Trex are loads better, in my opinion, lighter fried chicken (if there is such a thing)). You will see I do not give measurements because I do not measure when I make my chicken. That is just how fabulous I am with making my chicken, I’m so confident it’s gonna be awesome, I don’t bother to measure. And it’s always awesome. I will say, since I don’t eat dark meat and I’m a lazy eater so I don’t want to bother with bones and such, that I usually slice chicken breasts in strips and cook those. Takes tons less time while frying and all yummy white meat! 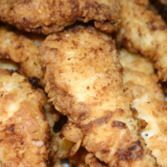 But these are some indicators if it’ll help you: 1 ½ Pints buttermilk; 3 Tablespoons salt; 1 Tablespoon Tabasco for 8 chicken breasts.